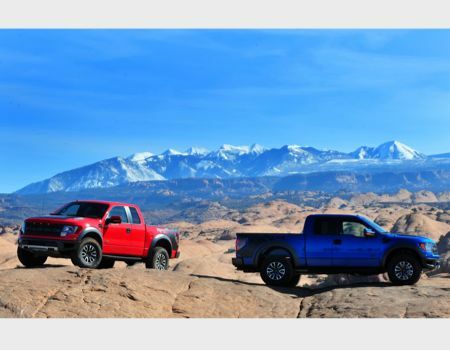 It has been a few years since a Ford F-150 Raptor has graced our test driveway, and in that time the model has seen a few enhancements to what is already a ‘roided-up version of Ford’s best-selling vehicle in North America. 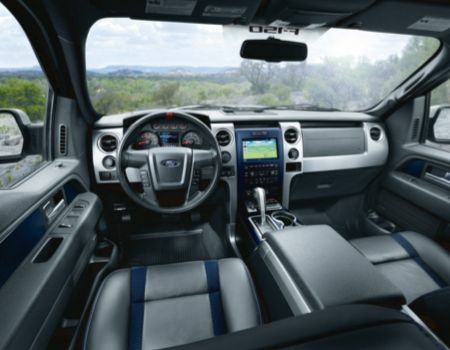 While the SVT Raptor is basically a Baja truck with NHTSA safety equipment and license plates, Ford includes its full complement of creature comforts as well. Thankfully that now allows for a SuperCrew cab variant and the beefier 411hp 6.2-liter V-8 engine mated to a six-speed automatic gearbox. This tradeoff is fuel economy of course, and in 4×2 mode the best Raptor can now muster is 11 mpg city and 16 mpg highway. New for 2013 is the offering of 17-inch aluminum wheels with beadlock capability thus enhancing offroading prowess. Model year 2012 saw significant styling upgrades, as well as a unique front view camera for extreme situations while allowing your “spotter” passenger to remain in the vehicle more often. The test model that recently arrived here came with the Raptor Luxury Package that made the day-to-day drivability quite pleasant thanks to heated/cooled front seats, power adjustable pedals, remote start, HID headlights and navigation among other things. 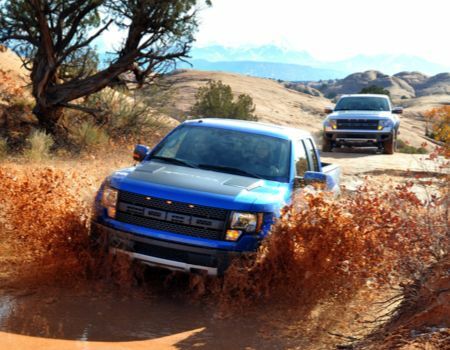 Getting down to the nitty-gritty of offroading in the Raptor, in my previous article I mentioned never leaving home in the truck without a rescue vehicle in tow as the Ford truck had some serious issues dealing with the muck and mud of East Texas. 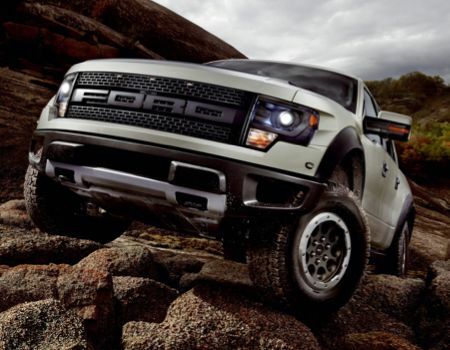 Since that time Ford has updated the front differential to a Torsen torque-sensing unit thereby enhancing Raptor’s capabilities. I found a bit of mud during my time with the truck, and after an afternoon of “fun” the truck now gets a thumbs up from me, although I still raise an eyebrow at the continued exclusion of a power winch feature. 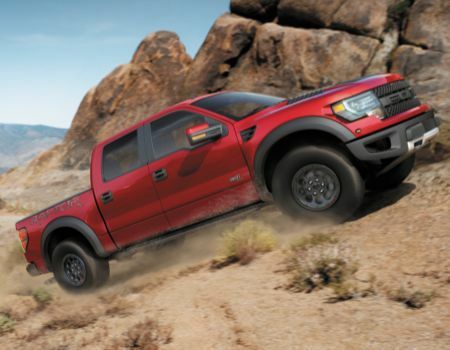 Pricing for the 2013 SVT Raptor begins at $46,240 with our tester arriving at $53,595. 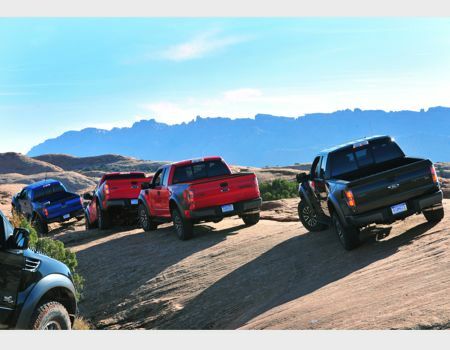 If offroading is the only standard you are judging a vehicle on the Ford F-150 Raptor may not be for you, but if you want a vehicle that can tow, haul, carry five adults in total comfort AND take you far away from the paved world then perhaps this is your huckleberry. 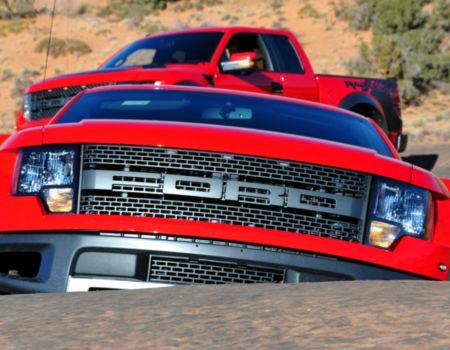 No sooner than I post this review on the 2013 Ford SVT Raptor than Ford announces the 2014 F-150 SVT Raptor Special Edition that will go on sale this fall. 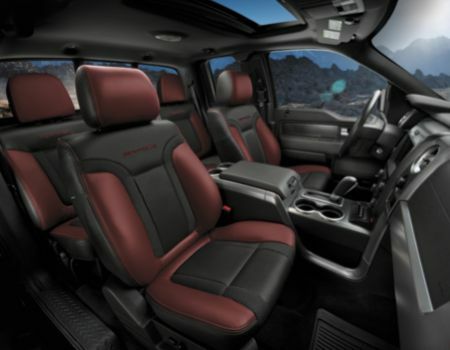 The new truck will feature a few unique new touches onto the existing Luxury package as we tested recently, including a ruby red metallic exterior color and box-side graphics along with brick red seat bolsters with black inserts and cloth honeycomb highlights inside along with a few other accents. For those not fond of the “no place like home” ruby slipper red Ford will also offer the special edition truck in tuxedo black metallic.